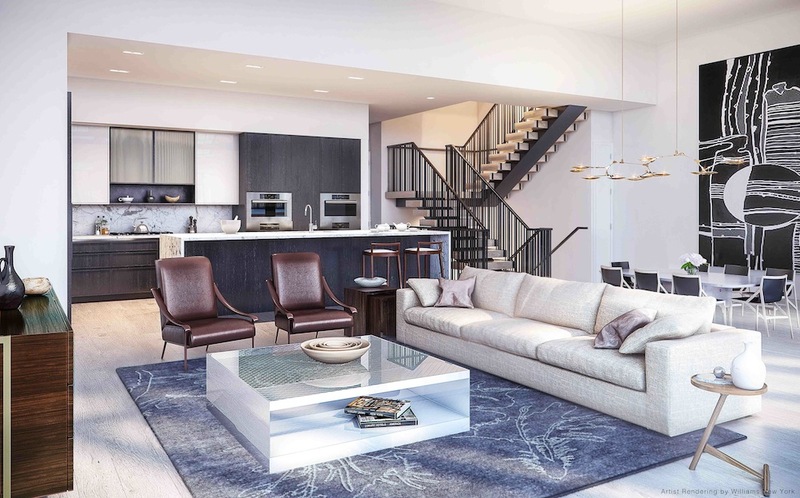 A floorplan has surfaced for one of the three townhouses at 11 Beach Street, HFZ Capital Group’s conversion in Tribeca. The L-shaped building, originally constructed in 1910, will be converted into 27 homes ranging from three-bedrooms to five-bedrooms. BKSK Architects is overseeing the 98,000-square-foot structure’s renovation, and Thomas Juul-Hansen crafted the interiors. Each of the three townhouses features a private elevator, a steel-canopied framed front door overlooking a side street and — splashiest of all — a glass-walled, Thomas Juul-Hansen-designed pool, as Curbed noted earlier this month. Townhouse C, a 4,827-square-foot four-bedroom asking $10.25 million, is already in contract, the Observer reported. 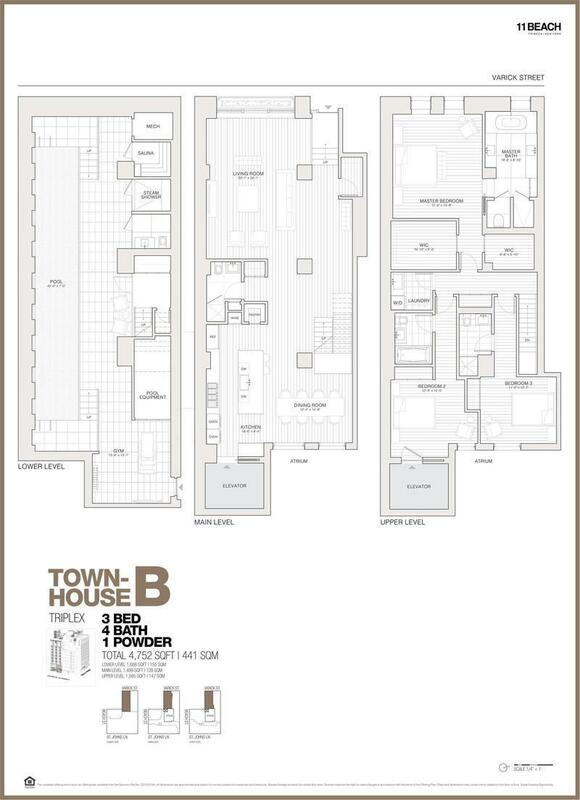 The townhouse traded in an off-market deal, floorplan unseen, but that’s not the case for Townhouse B, a 4,752-square-foot three-bedroom new to the market, asking $10 million. The triplex has a 23′ by 24′ living room and kitchen with eat-in dining area, cooking island and appliances by Sub-Zero and Miele that include side-by-side refrigerators, oversized wine cabinet and dual ovens. The master bath is wrapped in marble and stone, with dual sinks, enclosed shower and water closet. 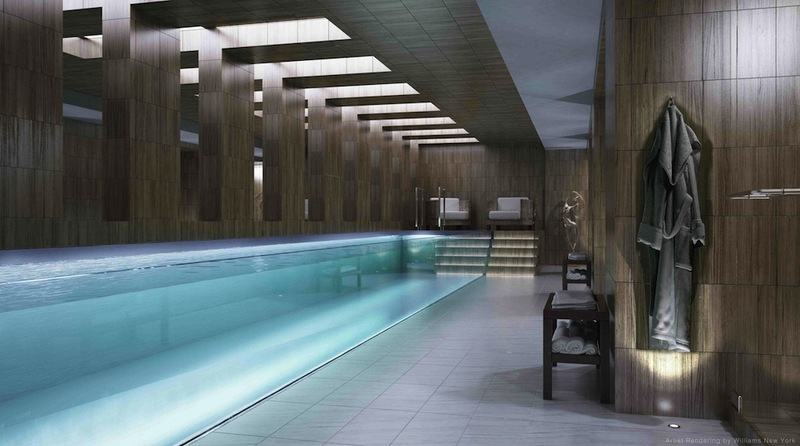 Forget “spa-like” bathrooms — the entire lowest level is devoted to the aforementioned spa, with a steam room, sauna, rainforest shower, lounging and exercise zones, capped by a custom 45-foot stainless steel pool with glass wall. Amenities at the development include a 24-hour doorman, landscaped roof garden, gym with “origami glass” skylight, children’s playroom and terra cotta-clad inner courtyard. Storage rooms are available for purchase. Douglas Elliman Development Marketing is handling sales. Craving more over-the-top floorplans and NYC development news? Sign up for the BuzzBuzzReport here.